Before I start writing this report I must declare a few things…… Yes I am biased. I am a member of the organising club CTC. But above all I am a huge fan of the race that is the Lost Sheep. This is my 5th year in a row competing in the Lost Sheep. I’ve raced it on days when it’s been too hot, I’ve spent 45 mins in the water, most of that stuck under the bridge, I’ve raced it in rain and gales. I’ve seen the whole spectrum of racing conditions and last saturday we were blessed with a near perfect day….light winds, cloudy but warm temperatures and calm waters. After the summer we’ve had, that in itself was nearly a miracle! 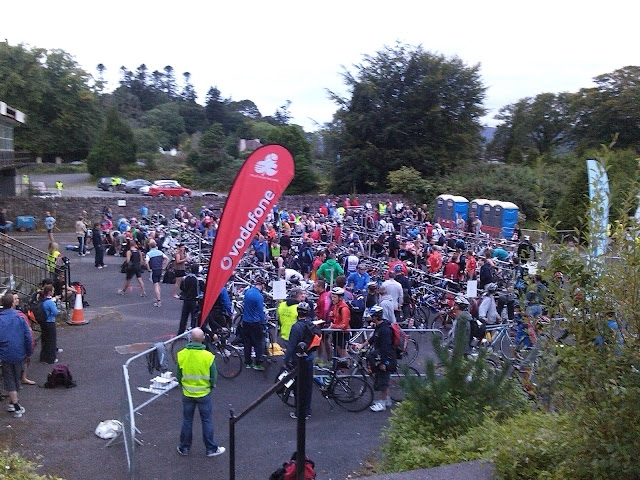 The 1.9k started and finished at the pier in Kenmare. We started a little after 8am (a lie-in after the previous few years when we had started at 7am!) and the sea was not only flat calm but it was warm!- 18 degrees reputedly. Team Waterford tri club emerged from the waters after only 24.21, closely followed by eventual race winner Shane Scully (25.50) and CTC’s own Trevor Woods (25.47). For the ladies Kait Strickland set a blistering pace with a 25.51 swim and Piranha’s Linda Clarke (26.32) and CTC/WCTC’s Katie Cooke (27.48) followed in her wake. On exiting the water competitors had to make their way from the pier to transition, some 1km away before heading off on the bike leg. The bike course consists of a loop starting from the Riversdale hotel in Kenmare, heading out towards Lauragh over the first of the three major climbs. It then takes a left just before Lauragh to take in the picturesque Healy pass, a category 1 climb. The descent from the Healy is technical and cyclists have to negotiate switch-backs, rough road surfaces and Sheep before joining the main Glengariff to Castletownbeare road. Another left turn here and there is a long undulating section to Glengariff before taking another left turn in the village and climbing the second category 1 climb, the Caha Pass. At the summit there is a fast descent and flat-ish stretch back into Kenmare and T2. It is a challenging bike course with very little time to recover. However, the support from Waterford Tri Club last saturday certainly helped get competitors up the hardest of the three climbs, the Healy pass. With elevated heart rates you might have thought you were hallucinating but the devil and at least 2 bananas were up there cheering people on Tour de France style! Shane Scully maintained his lead with a 2h18 bike split over the 83km bike. Trevor Woods came into T2 in second place with Liam Dolan moving up the field to third with the fastest bike of the day (2h17.03). In the ladies race, Katie Cooke took the lead (unbeknownst to herself- she was chasing what she thought was the leader until halfway up the Healy Pass when two kind cyclists informed her that she was first lady) and with a bike split of 2h36 came into T2 with a lead of some 14 minutes over Marie Boland in second with Louise Keane third female, both posting a 2h47 bike. The final leg of the Lost Sheep is the 21km out and back run along quiet country roads. This is somewhat akin to what I imagine childbirth to be….every year as I am running I say never again and find a million reasons not to enter the following year, but sure enough, only a few days/hours need to pass before I manage to forget the pain that is the Lost Sheep run and convince myself that it really wasn’t all that bad! In the true tradition of Irish triathlons, race organisers are not happy with just setting a hilly tortuous course but they like to compound the pain and suffering with finding the biggest hills in the vicinity of transition and incorporating them into the run. The Lost Sheep is no exception. Shane Scully powered his way to victory with the second fastest run of the day (1h19) finishing in an incredible time of 4h10. Liam Dolan had the fastest run, his 1h17 run was enough for him to overtake Trevor Woods and finish 2nd in a time of 4h16. Mariusz Olejniczak also ran his way through the field with the third fastest run (1h20) to finish third in a time of 4h19. Marie Boland had the fastest run split for the ladies but her 1h36 wasn’t enough to overhaul Katie Cooke who had the third fastest run split of the day (1h39) with Katie finishing in 4h51 and Marie Boland a further 10mins back with an overall time of 5h01. Louise Keane (CTC) rounded out the podium with a time of 5h09. I reiterate, I am biased, but I am also experienced with racing in Ireland and abroad and this race was both well organised and a pleasure to race. It started early, but not so early that it felt like an Ironman start, and so avoided the worst of the saturday traffic. The swim was well organised with plenty of support on and off the water. The bike course was well marshalled and the Waterford Triathlon Club support was strategically placed to take one’s mind off that ‘pinch’ at the top of the Healy Pass. It seemed appropriate somehow to have the devil up there, it’s a far from heavenly climb. The road surface is bad in places but again this was well sign posted. The post-race area was excellent and overall the atmosphere at the race and after the race was it’s usual fantastic self. Roll on 2013 and what will hopefully be another successful Lost Sheep half-iron distance race!